One day, I had a hankering for Jamaican beef patties. 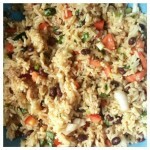 Then, I remembered, that some years back, a Jamaican friend of mine gave me her family’s recipe. So, I searched my recipe box to find it. I was thrilled that I found the recipe titled “Nanny’s Beef Patty.” The instructions were in two parts: 1 part beef filling and 1 part dough. I made a few adjustments to satisfy my taste buds. If you make this recipe correctly, you will never look at a store bought beef patty with the same affection. IRIE!!!! 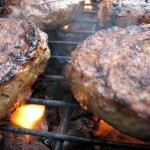 Brown the ground beef until thoroughly cooked along with the onion and garlic. Make sure to properly break up ground beef, so there are no chunks of meat in the sauce pan. When meat, onion and garlic is done, remove from heat and drain excess oil from sauce pan. Return sauce pan to stove with the heat setting on low. Now you can add your other ingredients. Add the remaining ingredients to the sauce pan and combine. Taste the mixture to ensure that it contains enough salt. Sauté mixture for about 3 minutes. Remove from heat, without the lid. In a large mixing bowl, add all your dry pastry ingredients including the butter. Use your fingers to incorporate the butter with the flour and seasonings. Slowly add water to mixture. Mixture should look crumbly, not wet. Kneed with the palm of your hand for about 2 minutes. Return dough to bowl and tightly cover with plastic wrap. Allow the dough to rest for about 20 minutes, while the beef filling continues to cool. After the dough has rested, preheat oven to 400 degrees. Remove dough from bowl and place on a floured surface. Make the balls a little bigger than a golf ball. Repeat the steps for each dough ball made. Fold dough in half, to make a half moon. Crimp the edges together to ensure filling is kept inside of the pastry. Repeat steps, until all pastries are made on the baking sheet. Place baking sheet in the oven, on the middle rack. 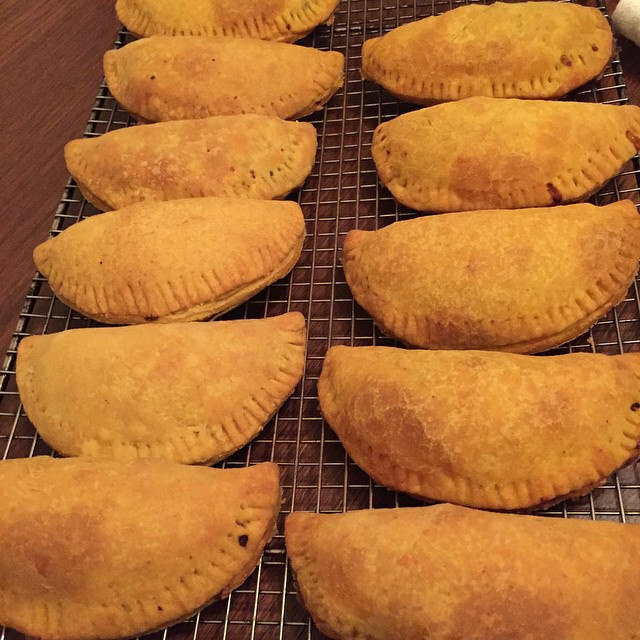 Did you enjoy reading Evelyn’s Homemade Jamaican Beef Patties? Well we enjoyed having you and would like to be friends!